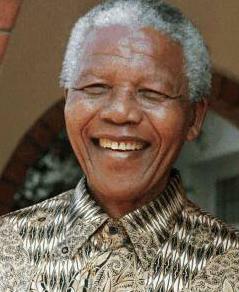 At 94, Nelson Mandela is still kicking, inspiring an international day of community service on Juy 18th in his name. This seems to be an idea that Barack Obama borrowed for similar events in the USA. While activists and athletes and entertainers, are honoring him by responding to his call for engagement, journalists in the obit departments of the world’s news networks are quietly, even secretly, combing their archives for footage and tributes that will air when he moves on to the next world. They are getting ready and seem to think it will happen sooner rather than later. I have already seen a program length obit that a major network has ready to go. Barring some major disaster at the same time, Mandela’s death may receive more visibility than the achievements of his long life. The question is: which Mandela will be memorialized? Will it be he leader who built a movement and a military organization to fight injustice or a man of inspiration with a great smile who we admire because of the many years he suffered behind bars? Having spent many years as a network producer, I know that the TV News industry’s instinct is to “humanize” the fallen by focusing on their symbolic importance. He was a symbol of a commitment to forgiving his enemies and promoting reconciliation, a man who was cut off from his family and, in the end, lost storybook love story with Winnie Mandela after years of painful incarceration. This approach also involves softening, celebratizing and depoliticizing a completely political person who said famously, “the struggle is my life” in the name of presenting someone who anybody can relate to, a big name to admire but not necessarily to learn from or get a balanced picture about. The idea is that Mandela will be likeable if he is like everyone else not that it is his stature as a leader that sets him apart. In the United States civil rights icon Martin Luther King has, in the popular media, been reduced to four words, “I have A Dream,” as if that was the sum of his thinking and the extent of his contribution. Ask any school kid about him and your will hear a recycling of those famous four words with no context or background. In South Africa Mandela has become a demi-God, he is seen as the man who unilaterally freed the country and who virtually walks on water. He is reated more in terms of a heroic myth than as a man who rose to an enormous challenge. He is certainly not a mere politician. Little attention was paid to how he saw himself as an organizational man, a “loyal and disciplined” member of the African National Congress and the movements it inspired. The accent on TV is always on top-down change by the great and the good, not the bottom-up pressure by freedom fighters at the community level who made the country ungovernable with help from armed fighters in exile, UN resolutions, economic and cultural sanctions, pressure by anti-apartheid militants the world over , and even the might of the Cuban army that defeated the South Africans in Angola. Media likes to personalize the story but its complexities are rarely linked together or told. He was born to a Royal family in a tribal culture and was. in his early years, an apolitical aristrocrat in South African terms who only slowly became a leader of the masses, who moved to the city to become a successful lawyer, who was initially part of an elite, a nationalist distrustful of radicals in a non-violent organization. He was also known as a lady’s man uncertain of his direction. As a member of ANC’s Youth League, he questioned the organization’s conservatism and challenged its mass base by recognizing after massacres of his people, that they would have to fight back. He became the leader of a group within his party committed to armed struggle, and traveled to other African states for military training. He was denounced as a terrorist but was careful to insure that that the bombs his comrades planted did not kill civilians. In short, he became a guerrilla fighter tthat the South Africans hunted along with the CIA. In fact it was the Americans who tipped the police off on where to capture him. There was no Julian Assange in this days to blow the whistle on their covert surveillance. This is not a part of his history that corporate media likes to project for fear of what it could encourage. The corporates and foundations that fund his foundation prefer to treat him as an icon that everyone loves, not an agitator that the establishment hated. His years in prison turned him into a non-person. He could not be quoted in South Africa and his picture could not be shown. The South Africans not only incarcerated him in their most remote and brutal dungeon, but they insured that he disappeared from public view. Despite the isolation, he was not forgotten, organizing the men around him into a unit of resistance, and politically educating younger captives in what was called Mandela University. He and his comrades did not let themselves or the growing ranks of their fellow priosners get discouraged. They stressed discipline to combat despair. How they did this, how he co-opted and befriended prison guards by speaking their language and finding out about their families, weakened their hostility and violence. He was always very strategic. He learned to contain his anger and not succumb to hatred to insure survival. Sure, he was lonely, but who in prison isn’t? As he mounted a protracted personal battle, he went inside, often hiding his personal feelings and vulnerabilities. He realized he was a role model and acted the part. On the outside, his comrades decided to turn him into a poster boy, to project him as the symbol of their struggle. The demand to “free all political prisoners” was replaced with the demand to Free Mandela.” He was an easier to market brand that way, and quickly became the focus of media attention. Soon, there were songs, concerts, TV documentaries and marches. As the world discovered his courage, South Africa had to take him more seriously as well after the regime was flooded him from people worldwide of all walks of life. with demands to release him. He was a risk taker— from his vow that he “was prepared to die”—a strident view his lawyers counseled against— to his willingness to talk with his enemies even as his personal pre-negotiating initiative bypassed his organization and worried many of its members. He had guts as well as charm. His stoicism and patience were legendary. He acted thoughtfully and leveraged his visibility to help his comrades who he insisted be released before him. He never lost his political focus. All of his utterances seemed profound to his growing ranks of followers even if they weren’t. He went on to make deals with Apartheid leaders, to blast his negotiating partner F.W. DeKlerk and then embrace him. He helped organize the country’s first democratic election and didn’t just run in it. All parties were welcome. He consciously built alliances across racial, political and tribal lines. He made compromises of his own principles in the name of avoiding a bloody civil war or reviving the economy. He then stepped down after one term, a rarity in Africa, He recognized the scourge of AIDS early on when some his colleagues wouldn’t. After his death, this fight for freedom that inspired the world that deserves telling but which story do you think the networks will tell? Will they present him as victim or victor, as a flawed person, as he sees himself—or as a saint cleaned up and repackaged for mass consumption? Will they give us the Hollywood one-dimensional picture of the soft and endearing gentle giant that turns him into a grandfatherly cuddly bear or the real saga of a liberation leader that won against the odds? News Dissector Danny Schechter produced the globally distributed South Africa Now TV series for three years and then was a director of six films focused on Nelson Mandela. He first came to South African on an anti-apartheid mission in 1967. Comments to [email protected].